Baby's first year is magical, and it goes by much too quickly. My baby milestone photo sessions are designed to grow with your baby and capture every precious detail along the way. I create clean and classic photos of your little one that you will cherish long after the baby days are behind you. I photograph your growing baby in my Randolph, NJ portrait studio. I carry multiple backdrops, beautiful photography props, and darling handmade baby outfits and accessories. These photo sessions are fun and sweet, and create the perfect setting for your baby's portraits. Our experience together begins with a pre-session consultation. I take the time to get to know you, what you envision for your baby's portraits, and provide guidance along the way. I also offer custom baby portrait packages to bundle multiple sessions into one beautiful watch-me-grow plan. Contact the studio to learn more and get the process started. The first opportunity for a baby portrait session is between three to five months of age. I start by capturing images of your baby laying down and looking up at the camera. They may also do other cute things like sucking their thumb, grabbing their toes, and rolling over. Then we'll turn them on their belly for a little bit of tummy time if they'll allow it. Some babies love this and will hold their head up to look around. If mom stands behind the camera we are usually able to capture some adorable smiles! My favorite time to photograph babies is around the mid-year mark. This milestone session can be scheduled anytime between six to nine months, once baby can sit up independently. These are also commonly referred to as "sitter sessions." Babies are usually very curious around this stage, not to mention very smiley! We'll get some adorable images of them sitting up and interacting with the scene around them. Some may even begin to crawl. I think it's a perfect time to capture images of your baby! The first birthday is the biggest baby milestone! This is when you will sit back and wonder where the year has gone and marvel at how quickly your baby has grown. I definitely recommend a photo session for your baby's first birthday. 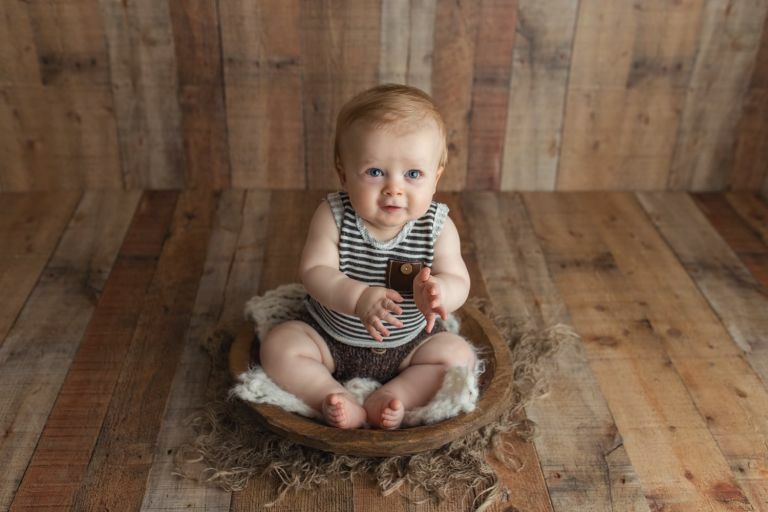 Some parents choose a "cake smash," which is a photo shoot to document your baby's first taste of cake. Others opt to skip the cake and do a classic first birthday milestone session instead. The ideas are endless, and we will customize the perfect set just for you! WHAT IS A BABY PHOTOGRAPHY SESSION AND WHY SHOULD I BOOK ONE? A baby milestone photo session is the name commonly used to refer to a portrait session of your baby at different stages or "milestones" within the first year of life. As any parent knows, babies grow and change at lightning speed. A milestone photo session attempts to capture all the new and wonderful things your baby is doing at different developmental stages. The days of your baby learning to hold up their head, rolling over and sitting up are quickly surpassed as they learn to take those precious first few steps. A baby photography session is a wonderful way to document your growing baby and have lasting memories of them before the baby stage is gone forever. When should I schedule my Baby Pictures? I generally recommend at least one or two milestone sessions in baby's first year. This really allows us to capture your baby at different stages and see how much they grow between each session. Some common milestone stages for baby photography include Tummy Time (3-5 months), Sitting Up (6-9 months), and First Birthday (11-13 months). I recommend booking these sessions as early as possible so that you don't miss out on any of those precious moments! WHAT SHOULD MY BABY WEAR FOR THEIR PHOTO SHOOT? 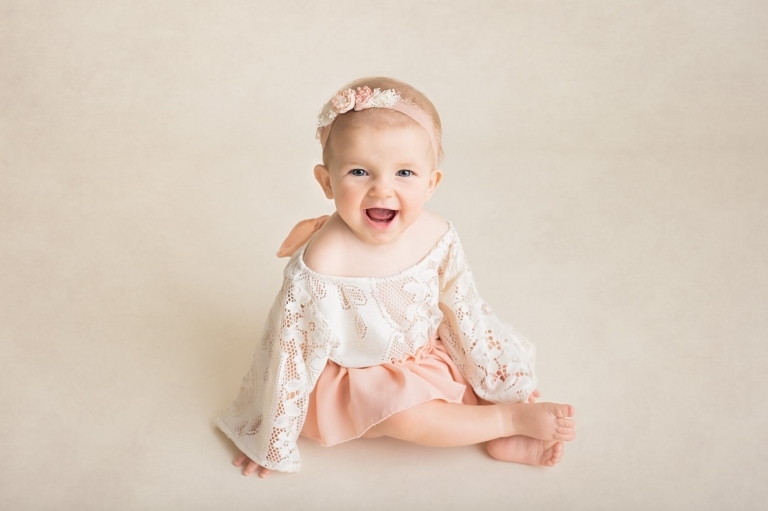 Any photographer will tell you that outfits can make or break the look of your photos, and a baby portrait session is no exception. For this reason, I carry a darling wardrobe in boy and girl 6-18 month sizes for my baby photography clients. My outfits are handmade and absolutely unique; you won't find them in stores. For baby girls, I carry beautiful matching headbands as well. This makes it easy for you to pull off a perfectly polished look with little to no effort! Each baby milestone portrait session is a little bit different because each baby is unique! Some babies are very social and have no trouble exploring on their own. Other babies don't want to leave their mom's side and may cry a little during their session. I don't rush into anything or ever want to make a baby, or a mommy, feel uncomfortable. If your baby needs a little bit of time to warm up, that is perfectly fine. I keep some baby toys and nursery rhymes playing in my studio to help babies feel at ease. I have always been able to get beautiful results, even if baby is a little shy at first.